At the least, yellow phone books pile up, door knob pizza flyers multiply and pools turn to swamp water. At the worst, drug dealers loiter and raccoons move in. 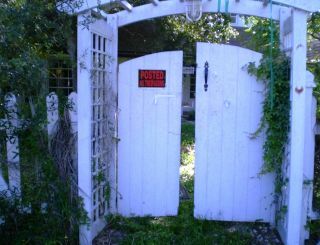 Vacant homes abound in Palm Beach County in the wake of the housing bust, that’s a given. But a new report adds empirical evidence to the anecdotes of knee-high grass and broken windows. Palm Beach County ranks second among large metro regions for its percent of vacant homes, according to a study released Thursday by the real estate analysis firm Trulia. With 6.7 percent of all housing units vacant as July, only Detroit is ahead with a 12.1 percent vacancy rate. The study used U.S. Postal Service data that tallies “active” and vacant homes. Seasonal and vacation homes are not counted as vacant, the Trulia report says. A home is considered vacant 90 days after mail delivery to the address stops. Neighbors put up this sign to shoo away people from an abandoned home on Heron Drive in Delray Beach. backlog of foreclosures in the court system and boom-time construction that ran ahead of demand. Delray Beach resident Diane Borchardt wasn’t shocked either. She said she’s been living next door to a deteriorating vacant house for years. In May, raccoons living in the house killed her cat Mooch, she said. Nationwide, vacancy rates are down slightly from last year, dropping from 3.6 percent to 3.4 percent. Some areas are seeing double digit percentage decreases including San Jose, Calif., Las Vegas, Nev., Denver, Colo. and Bakersfield, Calif., according to Trulia. Palm Beach County’s vacancy rate was a 6.5 percent decrease from last year despite the second-place ranking. While not all vacant homes are abandoned or in foreclosure, those that are can drag down property values and be an overall nuisance. According to the U.S. Government Accountability Office, vacant and foreclosed homes may reduce prices of nearby homes by $8,600 to $17,000 per property. In June, the inspector general of the Federal Housing Finance Agency released a report criticizing lax oversight of contractors tasked with maintaining vacant homes managed by mortgage backers Fannie Mae and Freddie Mac. More than 12,600 Florida homes were owned by the two enterprises at the end of 2011, the third highest of all states and 7 percent of their total inventory. According to the report, the agency did not conduct targeted reviews of contractors hired to mow lawns, repair roofs, change locks, maintain pools and paint. Diane Springer, code compliance coordinator for the City of Boynton Beach, said banks are better about maintaining homes since the city began requiring them to be registered in 2010. Boynton Beach has about 3,300 vacant and foreclosed homes. The vacancy rate is a good indicator of the shadow market, Kolko said. Vacant homes are less likely to have homeowners negotiating with the bank to find a foreclosure alternative and more likely to hit the market for sale. With a dwindling supply of homes for sale in Palm Beach County, Realtors said some shadow inventory would be welcome.